Young Marketer of the Year Winner 2018! Presentation at the VMA Annual Awards ceremony held on 15th March 2019. From left to right: Sally Phillips, Mo Gannon, Anna Thomas, Amy Scott, Nicola Jardine. 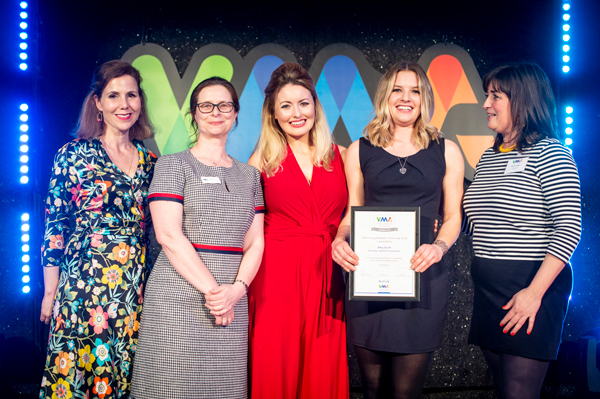 Amy Scott, Equine Brand Manager, Boehringer Ingelheim Animal Health Ltd, has been awarded the coveted Veterinary Marketing Association Young Marketer of the Year Award 2018. The quality of this year’s submissions was exceptional and the best since the Award began. In respect to the case study completed by all finalists, this is designed to confirm who has good marketing skills of their own, away from their day job and the support network around them and to ensure a level playing field regardless of the size of the candidate’s budget responsibilities. Sponsored by British Dairying magazine and supported by the VMA, the award recognises a young marketer either in age or experience who has demonstrated marketing flair within the veterinary and animal health industry. In addition to receiving a certificate of achievement and being invited to join the VMA committee, Ms Scott also wins a bursary worth £2,000 to put towards her on-going marketing training and development, as well as a personal prize of £500 in cash. Nikki Barclay, Senior Product Manager, Bravecto, MSD Animal Health. Killian Gaffney, Head of Sales and Marketing, UK & Ireland, Chanelle Group. Rob Simpson, Senior Product Manager, Ruminant Cattle Young stock, MSD Animal Health.